Haem is a cyclical structure containing an iron atom. In more detail, the structure called porphyrin is formed from four pyrrole nuclei each of which contains one atom of nitrogen and four atoms of carbon, the two peripheral atoms being bound to polypeptide sub-units which make up haemoglobin. 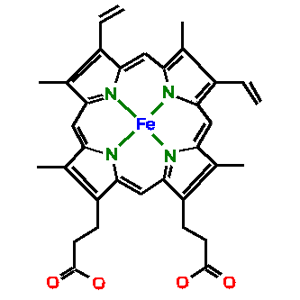 The iron atom is bound at the centre of the porphyrin by nitrogen atoms. The oxygen molecule binds to this atom during oxygenation of the blood. Haem is therefore an essential co-factor in haemoglobin.